2017 training program excavations getting underway at 3FR46. 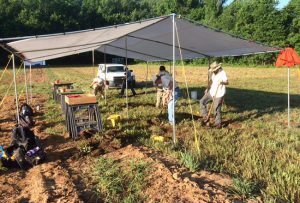 The 2017 Arkansas Archeological Society training program ran from June 10 – 25. We investigated two sites, 3FR46 and 3FR58, on Ozark National Forest lands along the Mulberry River in Franklin County. The project was a collaborative effort involving the Survey and Society, the Ozark National Forest, and the Cass Work Center. 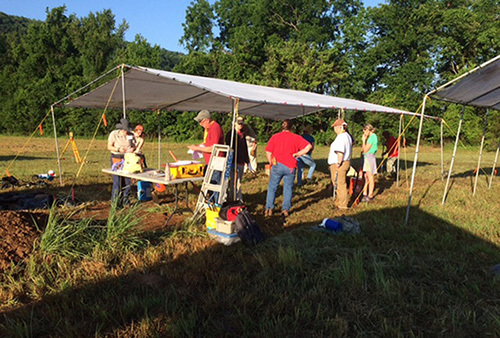 Project Director Tim Mulvihill (red shirt, cap) organizing Society members at 3FR46 field records center. The Mulberry River study area is located in the Arkansas River Valley upstream from the Carden Bottoms locality where we held the 2009 training program, and downstream from the Spiro locality where the Arkansas and Oklahoma Archeological Surveys are currently collaborating in ongoing investigations. Both of our training program sites are currently maintained under the Forest Service’s Mulberry River Native Vegetation Restoration program. Both sites were initially recorded in 1972 by Dr. John House (ARAS-UAPB research station archeologist), when he was conducting a survey of the Mulberry River basin in advance of a proposed impoundment project. 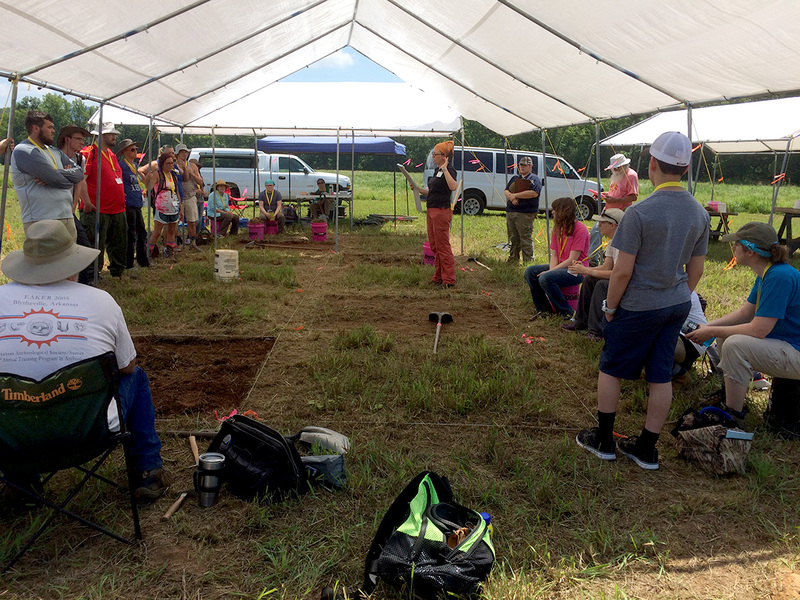 More recent investigations by Dr. Mary Brennan, Zone Archeologist with the Ozark National Forest, confirmed House’s earlier identification of Woodland and Mississippian components at these sites and retrieved artifact samples, including ceramics, lithics, and charcoal. Brennan’s team also identified potentially related sites in the vicinity, including rock shelters, rock art sites, an argillite quarry, and a possible mound, comprising an ancient cultural landscape reflecting Woodland to Mississippian cultural developments in the region. 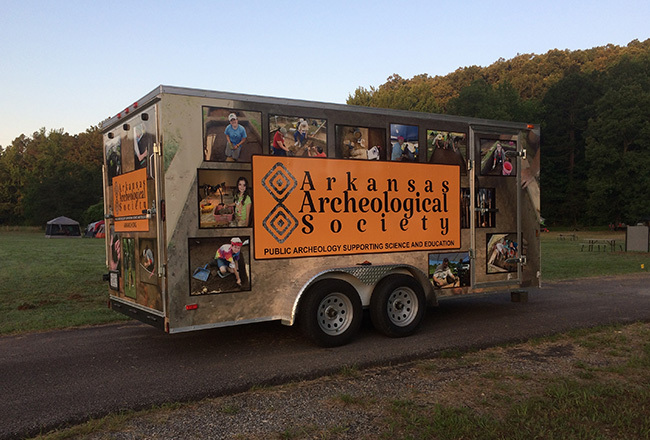 New AAS trailer with decorative “skin” marking the location of the project camping ground. Earlier this spring, Survey and Forest Service archeologists conducted a series of preliminary investigations. Dr. Jami Lockhart, with the assistance of Tim Mulvihill, conducted extensive geophysical surveys at both sites, identifying multiple buried features, both natural and cultural. Brennan and Mulvihill then conducted backhoe trenching at 3FR46 and excavated small test units at both sites, confirming the presence of buried cultural materials in geological contexts reflecting human use of a dynamic riverine landscape. Were intact features and midden deposits preserved at these sites, and if so, in what geomorphological contexts and in what conditions? What kinds of artifacts and other material remains (animal bone, carbonized plant remains, etc.) were preserved, and what time periods and cultural affiliations do they represent? We were especially interested in finding out if indigenous plant remains are preserved at these sites, so we can determine how this information might contribute to ongoing native vegetation restoration programs. What kinds of occupations (e.g., short-term seasonal, long-term residential, etc.) were suggested by feature characteristics and distributions, and associated material culture? How does this information contribute to current discussions of Woodland and Mississippian cultural developments in the central Arkansas River Valley? Society members starting excavations to expose a buried midden feature revealed in gradiometry survey. Guided by our preliminary investigations, excavation units at both sites were located in feature-rich areas most likely to produce the information needed to answer our questions. We hope that our findings will enable the Forest Service to work with descendant Caddo and Osage communities to develop best approaches for preserving ancient cultural landscapes in the Mulberry River Valley. The majority of lands along the Mulberry are privately owned and through the years have been converted to hay fields, pasture, and recreational areas. The government tracts where these sites are located provide valuable opportunities to restore and preserve cultural resources within habitats managed to resemble indigenously maintained settings, and we hope to contribute to those efforts. Dr. Jodi Barnes instructing Society members taking the basic excavation seminar at the 2017 Training Program.